Coach Erika Retamal Velarde was born in Lima, Peru. She is an attorney and a fencing coach. She came to Los Angeles in 2007. She got her Citizenship in 2012. Coach Erika has been involved in Fencing for more than thirty years. She started fencing when she was in school. She became a fencing coach at the age of eighteen years old. She started teaching fencing in exclusive private clubs in Lima, Peru. She has nineteen years of experience like a fencing coach. Coach Erika represented Peru in International Competitions (South American Fencing Championships) and is the Peruvian National Champion. 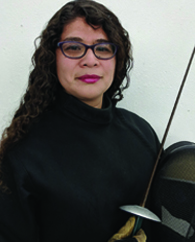 She is also a member of the United States Fencing Association, member of the Peruvian Fencing Federation, and member of the Peruvian Bar Association. Erika is very proud of all the medals, trophies, diplomas, and certificates that she gotten throughtout her career. She is experienced in all 3 weapons (Foil, Sabre, and Epee). For the past eleven years, Erika has taught fencing at private schools, recreation centers, and summer camps. All her students got a lot of trophies and medals in the fencing tournaments. Coach Erika works hard to prepare every student to be the best that they can.